South of Myrtle Beach, SC you'll find a small quaint active town known as Surfside Beach. Within Surfside you'll discover the sprawling but close knit resort community of Oceanside Village. 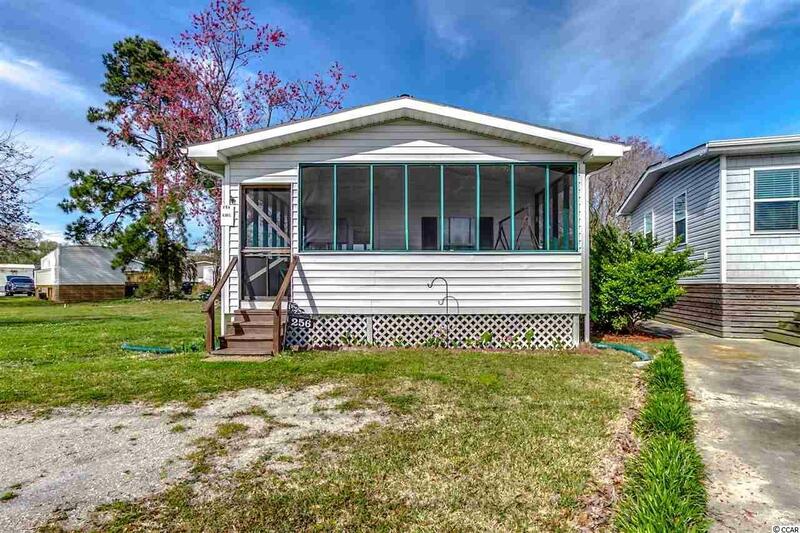 (Ask your agent for this home's virtual tour link) Literally walking distance from the beach this 3 br 2 bath home is close enough to the beach to smell the fresh, salt air. The photos tell a lot of this home's story. With it's massive wrap around screened porch and extra large lot set in front of a small park you can enjoy countless evenings outdoors comfortably. All plumbing replaced April of 2018. Third bedroom added and is pristine. This home has been very well maintained overall. Oceanside Village has it own Private Beach access, golf cart parking and 24 hour security. Many of Amenities for everyone including Heated indoor pool is open year-round, large outdoor pool with covered patio, outdoor lounge pool with covered patio, children's water park, picnic areas, playground, boccie courts, horseshoe pits, volleyball court, basketball and tennis courts, ballfields, stocked fishing lakes, library, fitness room, small community room (available to residents), large community center, Exclusive beachfront parking, gated entrances 24/7 security, planned social activities, Labor Day picnic, Fourth of July golf cart parade. Short walk or golf cart ride to the beach, grocery store, restaurants, etc. Weekly trash collection (semi-weekly in summer) Semi-weekly curbside debris collection Bi-weekly grass cutting/trimming. Children's activities director, Annual Town Meeting for status reports and homeowner feedback/input. Oceanside Village is responsible for maintenance of water/sewer lines outside the home. A Portion of the community property tax may be used for personal income taxes. Come see this home and make it your investment "place at the beach".